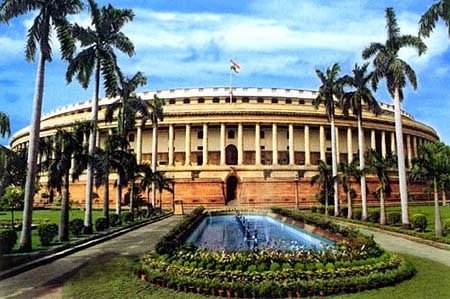 The Fourteenth Session of the current 15th Lok Sabha (Monsoon Session) was held between 5th August 2013 to 6th September 2013 with 21 sittings. 15th Lok Sabha commenced the business on 4th June 2009 and has till now has held 14 sessions with 335 sittings. Till the end of Monsoon Session 2013, Lok Sabha has worked effectively and transacted business for 1321 hours and 34 minutes. 799 hours 38 minutes was lost in disruptions and forced adjournments. In view of the adjournments, the Lok Sabha worked for 273 hours and 12 minutes extra, beyond the scheduled time, to compensate the loss of time. Nearly 43% of Lok Sabha time was lost due to disruptions in the current 15th Lok Sabha (all 14 sessions) and a portion of lost time was compensated with extra sitting. 202 bills were introduced in the 15th Lok Sabha so far and 171 bills have been passed. 3741 matters have been taken up by the Members of Lok Sabha under Rule 377 (matters of urgent public importance). 3208 matters of urgent public importance have been taken up during Zero Hour. 683 Standing Committee reports were submitted to Lok Sabha. The Members of Parliament are required to participate in the debates, raise matters of public interest, ask questions of public importance, introduce private members bills and to participate in the sessions (attendance). We can adjudge the performance of the MPs, based on their performance in the House. Lok Sabha Secretariat and PRS India provide the complete data relating to individual MPs. The following MPs secure the top 3 positions for participation in debates, as per the data released by PRS India. (from the 1st session till the end of monsoon session 2013 of the current 15th Lok Sabha). 1. Mr Arjun Ram Meghwal (BJP MP from Rajasthan) - 414 times participated in debates. 3. Mr PL Punja (Congress MP from UP) - 263 debates. Of 17351 debates recorded in all the sessions, top 100 MPs have participated in 10011 debates (58%). Since introduction of Private Members Bills involves more home work, only 84 MPs have introduced 372 such bills. Of this 84 also, only 11 MPs have introduced more than 10 bills. These 11 MPs have introduced 165 bills. 1. Mr Anandrao Adsul (Shiv Sena MP Maharashtra) - 1170 Questions. 3. Asaduddin Owaisi (AIMEM MP from Andhra) - 1042 Questions. Mr Pradeep Kumar Majhi (Congress MP from Orissa) has asked 1032 Questions. In the current 15th Lok Sabha, till date, only 4 MPs have asked questions beyond 1000. It may be noted that Mr Anandrao Adsul has been maintaining the No 1 position for questions from the 14th Lok Sabha. The following MPs are the top performers. Mr Asaduddin Owaisi, Mr Hansraj G Ahir, Pradeep Kumar Majhi and Mr Shivaji Adhalrao Patil (SS MP Maharashtra). Only 2 MPs have scored 100% attendance. We have considered the MPs who are functioning from the beginning of the 15th Lok Sabha. 25 MPs have a total tally of 'zero'. That means, they have not participated in debates, asked questions or introduced private bills. 34 MPs have single digit tally (1 to 9). Ms Vijaya Shanthi (TRS MP from Andhra and actress), Mr Ramesh Kumar (Congress MP from Delhi) have zero participation. Vijayashanthi's total tally (Debates, private members bills and questions) is 'zero' and her attendance is 12%. Interestingly, Mr Ramesh Kumar, South Delhi MP has scored a total tally of 'zero' with 100% attendance. Mr Rahul Gandhi (Congress MP and PM in waiting) has scored a total tally of 1, with one time participation in a debate. His attendance is 43%. Ms Sonia Gandhi (Congress MP) has a total tally of 2 with 47% attendance. Kalyan Singh, Dayanidh Maran, H D Kumaraswamy, Chandrasekar Rao (noted leaders) have a total tally of 1 or 2. Chandrasekar Rao (TRS MP from Andhra) has attended only 10% of the sittings. Let us all congratulate the top performing MPs. Irrespective of the party affiliation, they should return to Lok Sabha in the next General Elections. We are also proud that our Sansad Ratna Awardees viz. Mr Anandrao Adsul, Mr Ramasubbu, Mr Hansraj G Ahir, Mr Arjun Ram Meghwal and Ms Rama Devi have all maintained their lead positions and showing better performance. The full details of the performance of all MPs can be downloaded from the link.